This week we’ll focus on choosing fabrics. 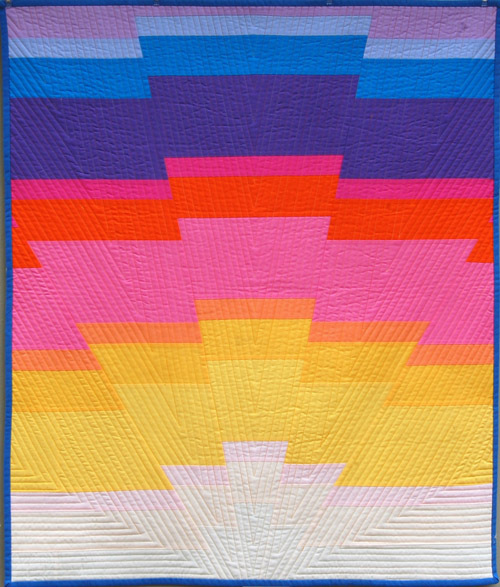 One of the striking features of this quilt – and a characteristic of Modern Quilting in general – is the use of solid colors. Notice that most of my colors are highly saturated; only at the very bottom of the quilt – the “horizon” – do they fade to light pastel shades. I used Benartex Colors for Quilters for my quilt, and you’ll find the exact color names and product numbers in the PDF (link below). I’ve also provided color charts for Moda’s Bella Solids and Robert Kaufman’s Kona Solids, but since color lines vary in tones and shades, some of the colors might not match up exactly with the Benartex solids. So, use your judgment when purchasing your fabric. Lay your fabrics out next to each other, and then decide whether the combination gives the “sunrise effect” you’re looking for. Don’t hesitate to substitute other colors or to mix fabric lines – this is your quilt, so select the shades you like! What if you don’t like solids? Feel free to substitute small or mono-colored prints that “read” solid. Avoid large prints, busy designs, and those with lots of colors – the extra lines and patterns will muddy the colors and you’ll lose the striking effect of the “fractured” sunrise. *See downloadable chart for alternate fabric suggestions. Step 1) Collect the fabrics. Select fabrics based on guidelines in the supply list and the chart. Step 2) Prepare the strips. Cut strips from each quarter yard of fabric on the crosswise grain, from selvage edge to selvage edge, to the exact measurements indicated in the chart above (furthest right column). Our Sunrise Baby Quilt Sew-Along continues on Tuesdays throughout March (5, 12, 19, and 26). In the list of fabrics to buy it states 1/2 yard, but in the cutting instructions, it talks about cutting these strips from each 1/4 yard. Which measurement is correct, as I really don’t need to buy excess fabric? Thanks for the prompt response. Look forward to making this lovely quilt! OOPS, I see they posted a correction. Please disregard my last post..
I’m only counting 11 fabrics in the picture.